First American Payment Systems, a leading payment processor, will allow merchants and partners to accept Apple Pay (TM), a payment solution based on Near Field Communication (NFC) technology, upon its release in October. In addition to NFC-ready devices, First American also offers EMV-capable devices with NFC technology that will allow merchants to be ready for both Apple Pay and the upcoming EMV requirements in 2015. 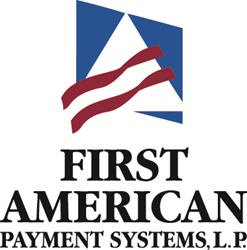 First American Payment Systems, L.P., based in Fort Worth, Texas, is a payment processor that provides comprehensive electronic transaction processing services for more than 140,000 merchants throughout the United States and Canada. In addition to credit, debit, and EBT card processing, First American offers a complete line of proprietary business solutions, including 1stPayPOS® tablet-based point-of-sale system, M+Terminal® mobile solution, Secur-Chex® check services, FirstAdvantage® gift cards, FirstPay.Net™ e-commerce solutions, FirstFund® ACH software, Govolution® government e-payments, iATS® Payments for nonprofit organizations, national ATM sales, and Merimac Capital® point-of-sale equipment and ATM leasing. For more information, visit http://www.first-american.net.